The 27-km Large Hadron Collider (LHC) is the largest and most powerful particle accelerator ever built. It accelerates protons to nearly the velocity of light -- in clockwise and anti-clockwise directions -- and then collides them at four locations around its ring. At these points, the energy of the particle collisions gets transformed into mass, spraying particles in all directions. The Compact Muon Solenoid (or CMS) detector sits at one of these four collision points. It is a general-purpose detector; that is, it is designed to observe any new physics phenomena that the LHC might reveal. CMS acts as a giant, high-speed camera, taking 3D “photographs” of particle collisions from all directions up to 40 million times each second. Although most of the particles produced in the collisions are “unstable”, they transform rapidly into stable particles that can be detected by CMS. 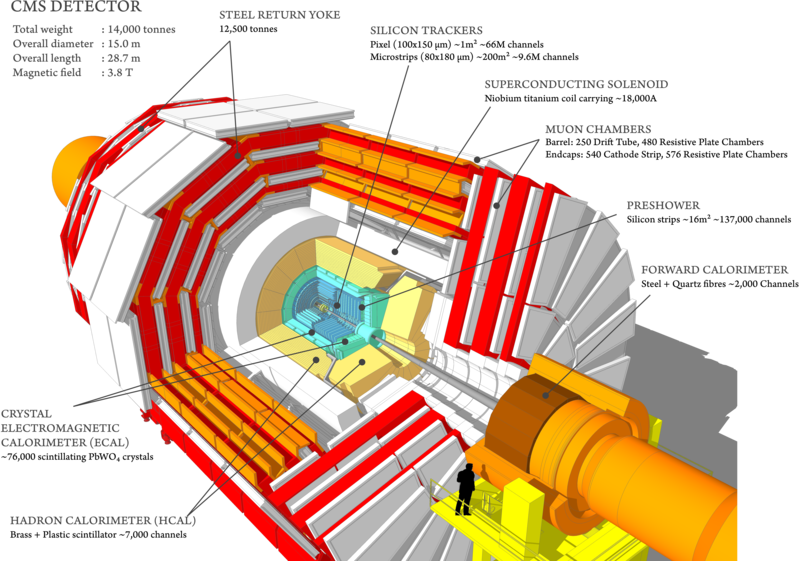 By identifying (nearly) all the stable particles produced in each collision, measuring their momenta and energies, and then piecing together the information of all these particles like putting together the pieces of a puzzle, the detector can recreate an “image” of the collision for further analysis. it has the most powerful solenoid magnet ever made. It helps to identify the charge of the particle: positively and negatively charged particles bend in opposite directions in the same magnetic field. It allows us to measure the momentum of the particle: in an identical magnetic field, high-momentum particles bend less compared with low-momentum ones. The solenoid magnet, which gives CMS its last name, is formed by a cylindrical coil of superconducting fibres. When electricity (18,500 amps!) is circulated within these coils, they encounter no resistance -- the magic of superconductivity! -- and can generate a magnetic field of around 4 tesla, which is about 100,000 times the strength of the Earth’s magnetic field. This high magnetic field must be confined to the volume of the detector and is done by the steel “yoke” that forms the bulk of the detector’s mass. The magnet coils and its return yoke weigh in at 12,500 tonnes, by far CMS’s heaviest component! This solenoid is the largest magnet of its type ever constructed and allows the Tracker and Calorimeters (see below) to be placed inside the coil, resulting in a detector that is, overall, “compact”, compared to detectors of similar weight. Merely bending particles is not enough -- CMS must identify the paths taken by these bent charged particles with a very high precision. This is done by a silicon Tracker made of around 75 million individual electronic sensors arranged in concentric layers. When a charged particle flies through the Tracker layer, it interacts electromagnetically with the silicon and produces a hit -- these individual hits can then be joined together to identify the track of the traversing particle. Information about the energies of the various particles produced in each collision is crucial to understanding what occurred at the collision point. This information is collected from two kinds of “calorimeters” in CMS. The Electromagnetic Calorimeter (ECAL) is the inner layer of the two and measures the energy of electrons and photons by stopping them completely. Hadrons, which are composite particles made up of quarks and gluons, fly through the ECAL and are stopped by the outer layer called the Hadron Calorimeter (HCAL). The final particle that CMS observe directly is the muon. Muons belong to the same family of particles as the electron, although they are around 200 times heavier. They are not stopped by the calorimeters, so special sub-detectors have to be built to detect them as they traverse CMS. These sub-detectors are interleaved with the return yoke of the solenoid. The large magnet of CMS also allows us to measure each muon’s momentum both inside the superconducting coil (by the tracking devices) and outside of it (by the muon chambers). An unusual feature of the CMS detector is that instead of being built in-situ like the other giant detectors of the LHC experiments, it was constructed in 15 sections at ground level before being lowered into an underground cavern near Cessy in France and then reassembled. Engineers found that building sections above ground, rather than constructing them in the cavern with all its access and safety issues, saved valuable time. Another important conclusion was that sub-detectors should be made more easily accessible to allow for easier and faster maintenance. Thus CMS was designed in fifteen separate sections or “slices” that were built on the surface and lowered down ready-made into the cavern. Being able to work in parallel on excavating the cavern and building the detector saved valuable time. This slicing, along with the careful design of cabling and piping, also ensures that the sections can be fully opened and closed with minimum disruption, and each piece remains accessible within the cavern. These considerations, along with the unique conditions of the LHC, affected the design of each layer of the detector. Download the mobile application Alaro and scan the photo below. Find instructions on how to do it here. You can also print this photo from here and scan it in a similar way.